When you decide to start your own business, you can do it impulsively because of a significant emotional experience or event in your life, like the loss of a job or the appearance of an opportunity, or you can do it slowly and deliberately by spending several weeks or months in study and preparation. In either case, investigate before you invest. I learned from a very wealthy man many years ago that it is much easier to get into something than it is to get out of it. It is much more important that you spend lots of time investigating, in advance, before you commit time and resources to a particular business venture. This will do more to assure your long term success than anything else. You’ve heard of the 80/20 Rule. This says that 20% of what you do will account for 80% of your results. Well, there is also a 20/80 Rule which says that the 20% of time that you spend in planning and evaluating at the beginning will be worth 80% of the results that you eventually get. When you decide to start your own business, you should start off with a complete business plan. There are several books on the bookstands that you can get for a few dollars that will give you all the ingredients of a business plan. There are computer programs that will walk you through the process of building a business plan. The assembling and putting together the complete business plan is the test of the entrepreneur. If you have the discipline to do it, you will find that it is neither hard nor complicated. It just takes a lot of work on your part, generating the different numbers that you plug in to the different parts of the business plan. Inc. magazine did a study of 100 start-ups a few years ago, 50 of which had done detailed business plans before they began and 50 of which had started on the back of an envelope or with an idea in the mind of the entrepreneur. After five years, they went back to interview the business founders. Most of the companies that had started without a business plan had gone bankrupt, ruining the founders and usually their families and friends in the process. Virtually all the companies that had started with a business plan were flourishing. Many of the business planners did complete business plans again every single year, sometimes spending weeks per year on their new business plans. But here was the most important point. They asked the company founders how important the business plans had been to running their businesses. The answer they got surprised them. These people said that once the business plan was done, it was usually put in a drawer and hardly referred to again throughout the year. The exercise of thinking through the ingredients of the business plan prior to starting work was the most important part. By doing a business plan, it forces you to think honestly and objectively about every part of the business before you begin. It will end up saving you an enormous amount of time and energy and will do more to guarantee your success than any other investment of time you can imagine. Remember, time is money but money is time as well. If you have to work for five years to assemble $20,000 to invest in your business, that $20,000 represents five years of your life. You must invest and spend this piece of your life very, very carefully, and a business plan enables you to do it. A business plan begins by your defining clearly the product or service you are going to offer in terms of how exactly it will benefit the prospective customer. You must determine exactly how much you will be able to charge for the product or service relative to how much you will have to pay to make your product or service available in the first place. For a new product to move into a competitive marketplace, it must have at least three factors about it that make it superior to whatever else is available. It must have three features or benefits that make it stand out and enable it to offer more than anything else than current customers may be using. It must be faster, cheaper, easier to use or possess different features, factors or ingredients that other things don’t have. A business plan is usually a month by month projection, going forward about 18 months, of how much you intend to sell of your product each month along the top line. Imagine that you are going to be brought in front of a board of bank examiners and they are going to ask you to explain and to defend every number on your plan. Discipline yourself to think through thoroughly every single number and base it on the most specific facts and details possible. If you project a certain level of sales, you should be able to show exactly how much advertising you will do and how many leads the advertising will generate. You should be able to show exactly who will call on or speak to each of these customers and how many sales can be expected from this prospect base. You must be able to estimate the exact amount of sale per satisfied customer and the amount of growth and net profit per sale, per product, per customer, per call. There are proven practices and actions that successful business people have used time and time again. When you apply the same techniques, tips, and strategies, you, too, will start and build your own successful business. 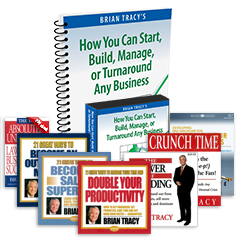 Learn more in my step-by-step guide How You Can Start, Build, Manage, or Turn Around any Business! Find out more information of how you can start your own business!